For those of you who don't enjoy farm fresh eggs on a regular basis, you're likely wondering what's to peeling a boiled egg? But, for those of you who have struggled with boiling farm fresh eggs only to want to toss the entire batch when you're attempting to remove the shell and half the egg comes with it, this post is for you. Choosing eggs that are at least 10 days old will likely resolve the issue, however, I find a very simple tip to have worked every time I've boiled eggs, one day old or 20 days old. Keep the eggs cold, in the refrigerator, until the water is boiling. Then, with a spoon, drop the slowly into the boiling water. I've also read many people have success with adding 1/2 teaspoon baking soda to the water, but I've never had reason to try it since I have success with adding cold eggs to boiling water. It is believed that the reason a very fresh egg does not peel as well as an older egg is because the ph of the fresher egg white is low, causing it to adhere to the membrane lining the shell more firmly. As the egg ages, the ph increasing, allowing for more air between the white and the membrane. Here is my simple, always perfect, boiled egg "recipe". Add cold water to a medium-size saucepan. You'll want the water to cover the eggs by an inch, so if you need to measure, put the eggs in the pan, add the water, then remove the eggs and put them back in the refrigerator. Remove the eggs from the refrigerator, and with a spoon, carefully lower the eggs into the pan of boiling water. Turn off the heat, cover the pan, and let sit for 15 minutes. 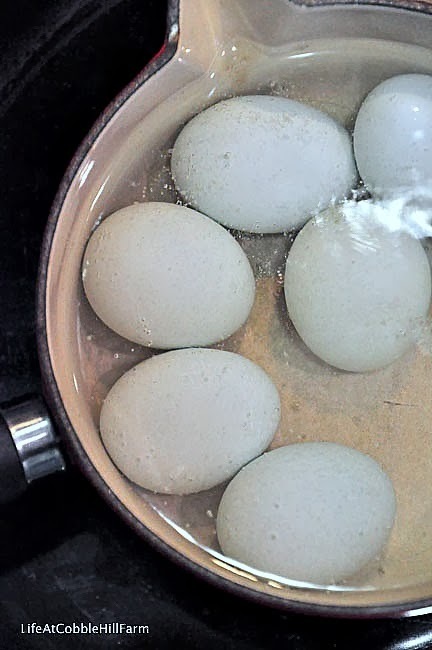 Remove the lid, drain off water, and fill pan with cold water to stop the eggs from cooking. Drain cool water and peel. I can really use this! Since we've been buying our eggs directly from the farmer, we've had a more difficult time with it. Pinned again! 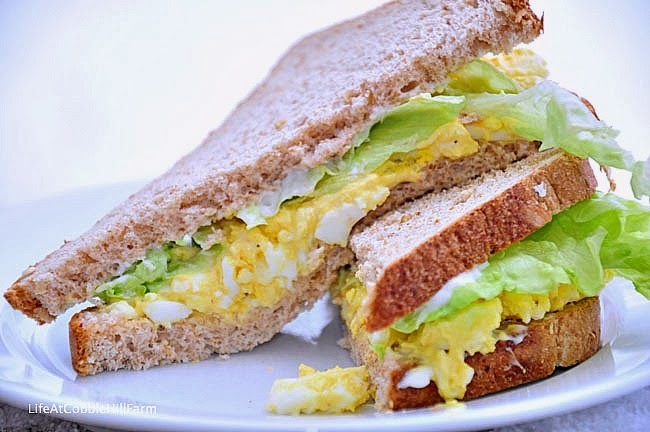 That egg salad sandwich looks yummy! I'll have to see if you have any secret ingredients in the recipe. Interesting! I don't boil eggs very often, but I will keep this in mind. It's kind of strange but I actually eat fewer eggs now than I did before I had chickens! haha. Your eggs are so pretty! I love that photo. I've struggled with this for far too long. Thanks for the tip! The eggs are so pretty. Lovely advice, now I just need to learn to crack an egg properly! Good to know. I don't often boil eggs, but I do use fresh free-range Amish market eggs. Recently, I was forced to buy grocery store eggs (needed them ASAP), and I could really taste and see the difference. The grocery store eggs had such pale yolks in comparison. Now you've given me a craving for egg salad. 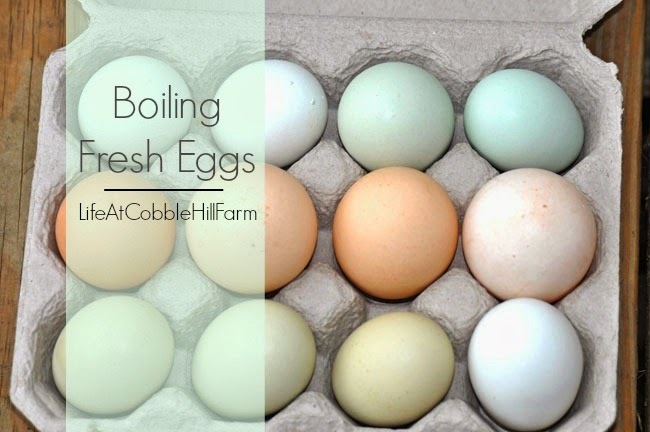 Steam the farm fresh eggs instead of BOILING them all together! Put them in the steamer basket, put on the lid, turn on the burner, 20-22 minutes later, perfect, easy to peel "boiled eggs"! If you really want a surefire method to peel fresh fresh eggs, try steaming them. 15 minutes in the steam and then an ice bath and you will get a perfect peel 97.3% of the time(I love made up statistics).